The need for a hose in any garden is rather self-explanatory. Hoses have multiple uses, and any self-respecting gardener simply cannot do without one. However, the trouble with hoses – how and where to store them. They can also be rather cumbersome to carry every time you need to use them out in the field. To be on the right side of the fence, you need a hose reel that runs smooth like a glass. Thank the stars for the best hose reel. This cylindrical spindle comes in handy for both the storage and transportation aspects of garden hoses. Step into any store specializing in gardening equipment or go online and you are bound to find endless options of garden hose reels all claiming to be the best in the market. How then do you know the difference between the best hose reel and those just claiming to be the top in the market? This simple guide provides you with some practical tips to consider when shopping for a hose reel as well as a comparison of some of the best sellers in the market today. Pricing table with an Table ID of "100" is not defined. **Below, you’ll see more detailed reviews, but you can also click the links above to see current prices and read customer’s reviews on Amazon. From the materials used right to the design, the Eley/ Rapid Wall Mount Garden Hose Reel Model 1041 is simply a work of art. This reel comes with a stainless steel mounting hardware, and the reel itself is made from aluminum alloy. The alloy is rustproof, and thus you do not have to worry about the longevity of your reel. The wall plate is coated with a Spartan-brown powder that also makes it rust proof. This wall plate is also quite easy to mount making the entire reel rather user-friendly. 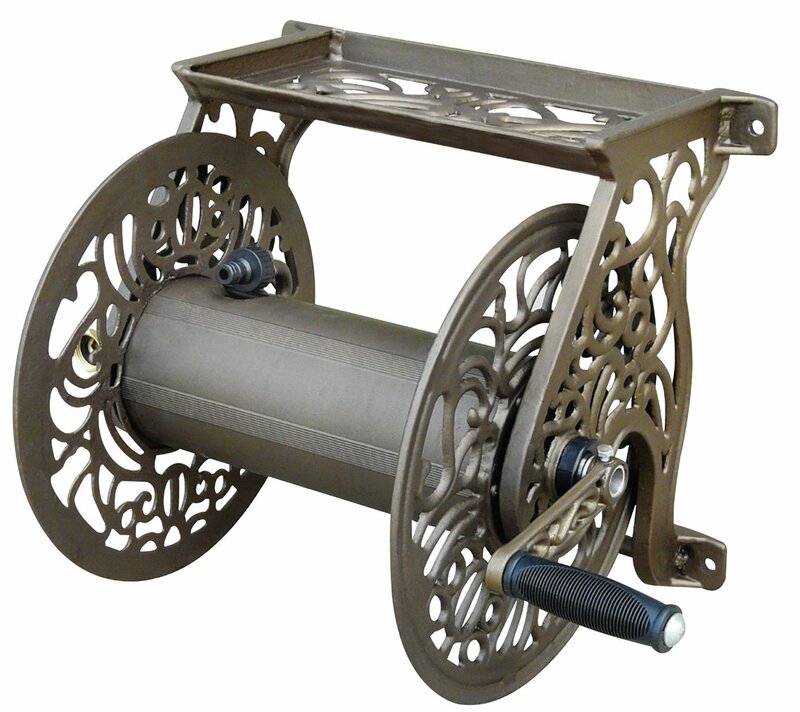 The manufacturers of this hose reel are so confident in the quality of their product that they offer a 10-year No-rust, No-leak and No-break warranty to all its customers for this model. The reel is fitted with a 6.5-foot polyurethane inlet or jumper hose and a stainless steel brass rotary union or swivel. This combination makes this hose reel leak proof. With this reel, you have the flexibility to either mount it horizontally or vertically depending on your preference. You can mount it on stucco, brick or concrete wall. The design also caters to both right and left-handed people by offering the option of either right or left-handed rewinding. Be careful, however, not to mount this reel on pressure treated lumber as the treatment agents (Copper Azole and Alkaline Copper Quaternary) can be corrosive when in contact with aluminum. This model also comes fitted with a ¾-inch, full-flow gooseneck swivel and a 5/8 inch inlet hose capable of reaching up to 150 feet. It can work under maximum temperatures of 600C (1400F) and can achieve a maximum pressure of up to 150 PSI. Other key features of this hose reel include a cam lever brake, smooth spinning axle bushings, a crank handle, and a hose strap. Well thought out design and build. 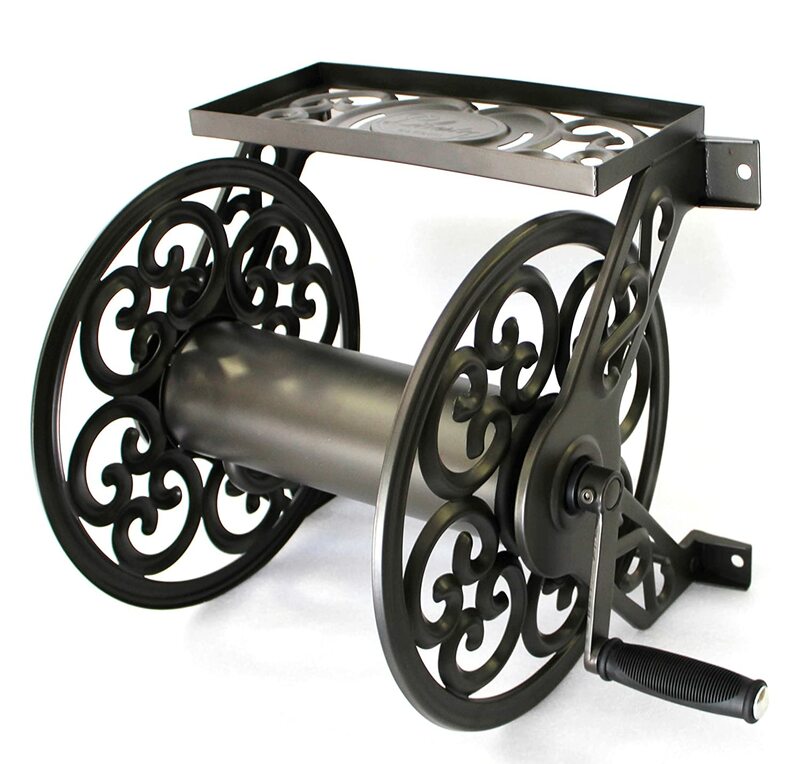 This hose reel has an aluminum frame that is fitted with brass and galvanized fittings as well as spiraled flourishes. It can easily hold up to 125 feet hose. It comes fitted with a storage shelf that is 7 inches long and 14 inches wide. It also comes with a five-foot leader hose. This model comes fully assembled and ready to use. All you need to do is attach the handle and mount it on a wall of your choice. Its durability is ensured by the heavy-gauge, cast-aluminum frame that has a powder coated finishing. It measures 15 inches in length, 22.8 inches in width and 15.4 inches in height and weighs a total of 11.6 pounds. It has 16-inch horizontal mount holes and 13.5-inch vertical mounting holes. You require minimal effort to reel out the hose. This hose reel has also been built to be leak proof. 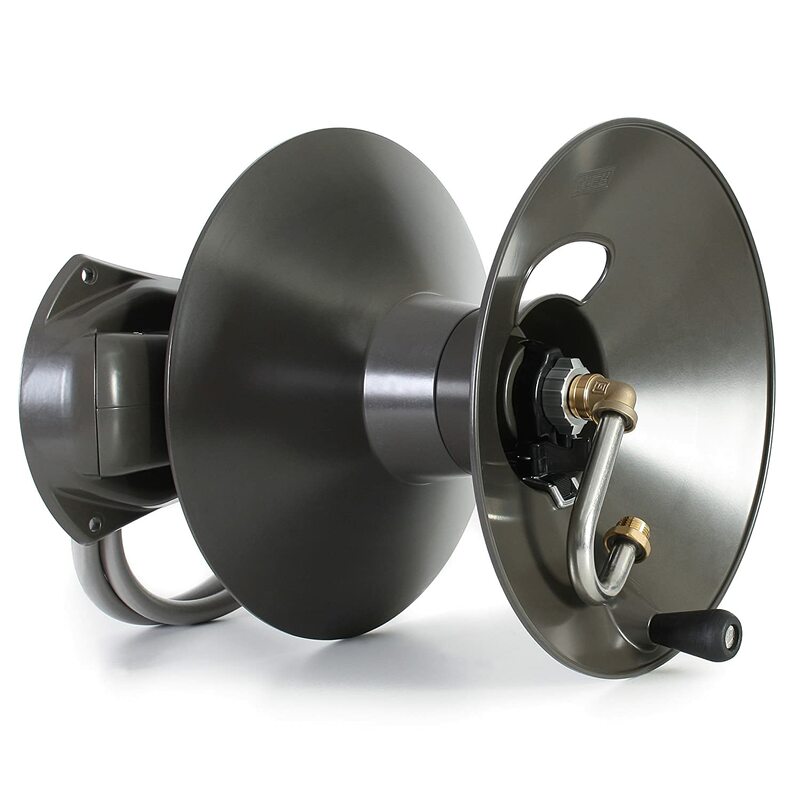 Due to its dimensions, this hose reel is ideal for mounting in those tight spaces. It is suitable for residential use as well as for a heavy-duty commercial setting. If you happen to break any of its parts, you can easily find replacement parts in the market at affordable prices. The Suncast CPLSSM200B swivel hose reel operates on a power wind motor. The beauty of this reel is that it automates the task of reeling your hose in and out of the housing unit making your work that much easier. It is capable of holding a maximum of 100 feet of a 5.8inch hose. It is fitted with a foot paddle that eliminates the need to bend every time you wish to wind your hose. By using an automated power wind to reel in the hose, this hose reel performs this task 2.5 times faster than its automatic counterparts. To keep your hose from bending or being stored in a manner that is far from being neat, this hose reel is fitted with a smart-trak hose guide that takes care of tidying up the hose for you. 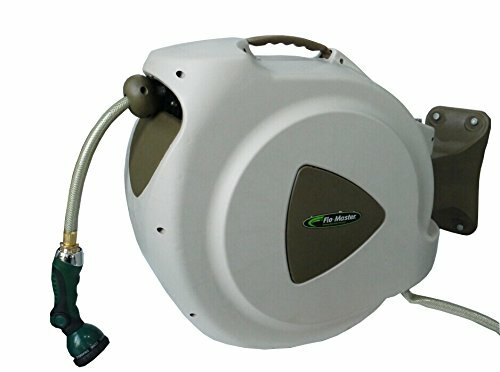 This automated hose reel is powered by a 12V battery that can be recharged. When fully charged, this battery provides enough power to perform a maximum of 20 wind-ins. The battery can be charged from any standard 120V outlet. It comes with a color gilding system that is helpful for monitoring the status of the battery’s power. It comes already assembled and ready to use. To help with the mounting, this power wind motor reel comes with stakes that help you secure it firmly to the ground. Its lid is liftable allowing you to gain easy access to the hose whenever you need to. If the battery runs out of power, you can easily operate this reel manually using the crank. 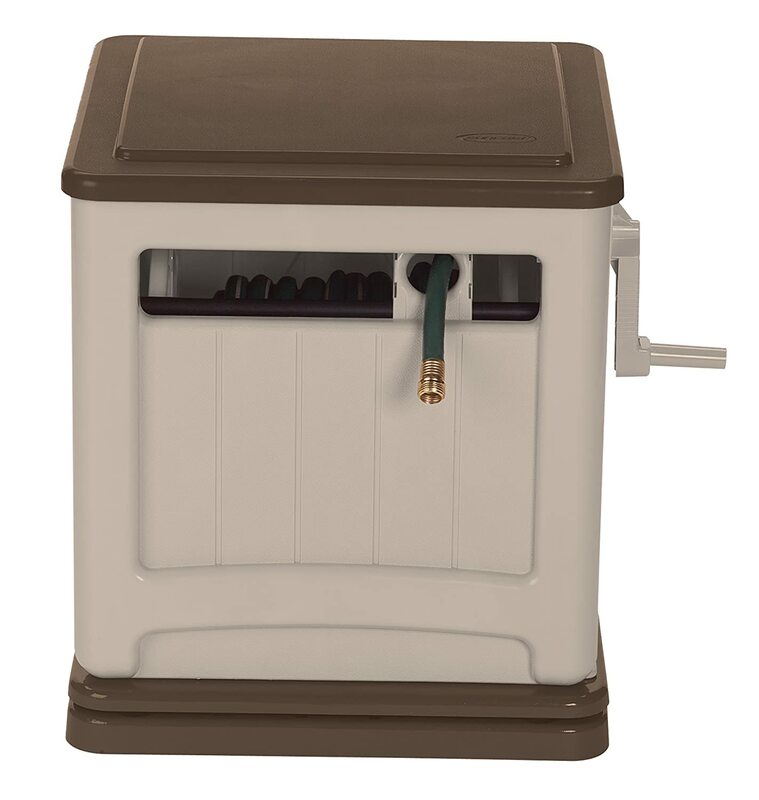 Another key feature of this hose reel is the fact that it comes with a storage bin that can be used to store your gardening tools and other supplies. This hose reel is light in weight, weighs only 23 pounds, making it easy to move and carry. As far as style goes, this has to be the most stylish reel yet. It is made from durable steel that is reinforced with a powder coating that makes it both rust proof and weather-resistant. It can hold a maximum of 125 feet of 5/8 inch hose. It also consists of 5-feet leader hose. With this hose reel, you do not need to worry about the assembly bit as it comes fully equipped. It also comes fitted with a shelf that makes it easy for you to store your gardening and watering tools all in the same place. This model does not, however, come with mounting hardware. You would, therefore, be forced to go out and purchase this separately. It also does not come with a garden hose. This garden hose reel is 15 inches long, 21 inches wide and 15.7 inches in height and weighs a total of 12 pounds. It comes with a limited one-year warranty. The Flowmaster RL Flo-master 65HR8 Retractable hose reel is gaining popularity each day. This is attributable to its design as well as some of its unique features. This hose reel measures 2 inches in length, 13 inches in width, and 23 inches in height and weighs a total of 26.2 pounds. It comes equipped with a retractable spring-loaded hose that has a stopper to keep the winder from getting stuck. Its wall-mount bracket comes with a 180-foot swivel that makes it possible for you to water a wide area hassle-free. Its detachment pin is simplified to make it simple for you to store it away whenever necessary. It also comes with a one-year manufacturer’s warranty. Also included in its package is a 65-foot, 5/8-inch garden hose, brass fittings, an eight spray mode nozzle and an instruction manual. The hose has a yellow sticker on it to mark the maximum length which can be pulled out without damaging the retracting mechanism. The housing unit including the reel is made of plastic. It is also advisable to mount the reel on a stud rather than directly bolting it to the wall. During winter conditions, you are advised to keep this reel inside. You can easily detach it from the wall mount by removing the pin while holding onto the carrier handle. The eight different modes provided by the nozzle are the shower mode, center mode, flat mode, soaker, mist mode, jet, triangle, and cone modes. With the need for the best hose reel being more apparent to gardeners, it is no wonder that there are new players in the market. With the constant introduction of hose reels differing in their build, materials, mechanisms, and designs, you are bound to be rather confused when trying to find the best reel. We, however, hope that this simple guide will prove useful in making the task of shopping for the best garden hose reel for your needs a straightforward one. There is a variety of materials used to manufacture hose reels. These materials range from fiberglass to metals and even plastics. Hose reels also differ in the mechanisms used to operate them. Some hose reels are motor-driven, some make use of a hand crank while others are spring-driven. Differences in hose reels also come in where mounting is concerned. Some can be mounted on trailers, carts or trucks while others are meant to be permanently placed in one spot. Ideally every garden hose reel, regardless of material, mechanism or mounting options, should make the life of a gardener much easier by making the work of storage simple as well as making it easy for them to extend the hose as needed. As the name suggests, these garden hose reels are made to be mounted on the wall of your house or property. They can either be mounted horizontally or vertically. A vertical mount will see you pulling the hose directly from the wall while a horizontal mount will see you pulling the hose along the wall’s side. This type of hose reels is pocket-friendly and suitable for those who do not necessarily have to keep adjusting the position of their reels. Stand alone reels are a perfect fit for people looking for the convenience of owning a hose reel without the commitment of mounting it to a wall. They are especially useful for people who do not own the home and thus cannot afford to drill holes in the walls. They are often retractable and can hold between 50 feet and 225 feet of hose. They are also applicable in some firefighting scenarios. People with a large yard or who are prone to moving on a regular basis will tend to prefer the portable or stand-alone options rather than those that require you to mount them on a wall. Now that we are familiar with the different types of mounts applicable to hose reels, it is time to delve a little deeper into the features to look out for when shopping for a hose reel. A good hose reel is one that is leak proof. This feature not only helps you conserve water but keeps your reel from rusting. Ensure that your reel of choice comes with a high-quality swivel to keep it from leaking. The type and quality of materials used to manufacture your hose reel of choice have a direct influence on its durability and longevity. Aluminum alloys, stainless steel, and lead-free brass mounting hardware are your best bet for durable products. Consider high-quality plastic for the reel. This option helps to keep rust at bay. Due to the versatility of use that comes with garden hoses, you may find yourself needing to use your hose reel several times in a growing period. Consider the type of plants you are tending to as they determine your usage. The longer the growing cycle, the more frequent the use. In this case, opt for stainless steel, lead-free brass or aluminum alloy frames as they are best suited for heavy-duty use. Depending on the size of your garden or lawn, you may find yourself in need of a portable reel. These come in handy when you have a large land. If going for a portable reel ensure that it comes with rugged rubber tires. Especially if you are working on moderately rough terrain. Also, think about what works best for you. Is it a four-wheel or a two-wheel cart? A four-wheel cart offers better balance and is simply easier to use than its two-wheeled counterparts. It is, however, more costly. The winding mechanism determines the ease of use of your reel. Auto rewind or retractable models are much easier and faster to use than manual rewind models. Most good quality reels make use of water propulsion to wind the hose. Regardless of the reel, you choose to purchase, be sure to take care of it to ensure its longevity. The manufacturers might have done their due diligence in ensuring that the reels are made from the best available quality parts, but if neglected, the reels are bound to have a much shorter shelf life. Be sure always to clean your reel to keep water and dirt from accumulating and damaging both the reel and the hose it houses. Also, be sure to thoroughly inspect your reel before fixing it for any potential leaks. It helps to fix the leaks as early as possible to keep them from damaging your reel later. Drain any water from the hose or the reel before storing it away during winter. Once the winter season is over, be sure to treat all the rubber gaskets with silicone grease before reusing it. If you have mounted your reel on a wall and cannot bring it inside during the winter, then you have the option of disassembling the various parts. Be sure to thoroughly clean and dry them before storage and drain any water still held within the reel. Another protective measure to enhance the longevity of a garden hose reel is to paint it with either clear acrylic paint or to coat it with a clear finish protective coat. 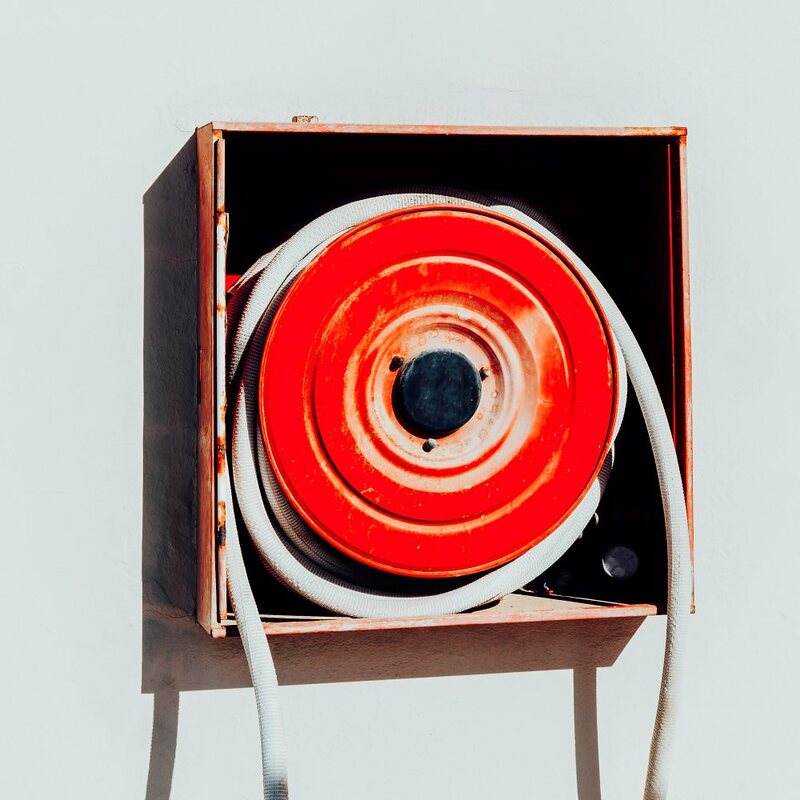 Doing so helps to keep your hose reel from rusting while enhancing the aesthetic appeal of your reel regardless of the season or frequency of use. Be sure to also oil all the moving parts regularly to keep them from damage as a result of wear and tear that comes with every use. Of all the garden hose reels reviewed in this guide, our choice has to be the Eley/ Rapid Wall Mount Garden Hose Reel Model 104. This garden hose reel combines an aesthetically appealing design and high-quality craftsmanship to give a high-functioning and durable product. 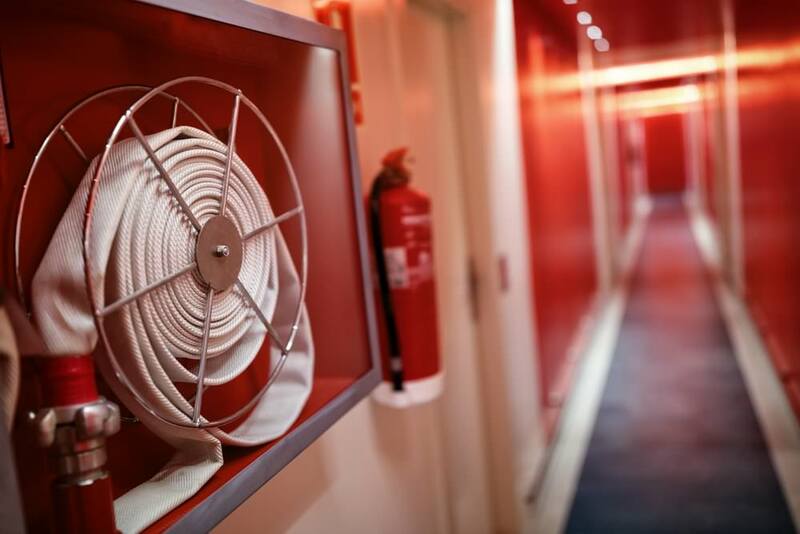 It works smooth like a glass and you wouldn’t need another hose reel again – as reliable as the one at the firehouse! We are particularly pleased with the safety measures taken to keep the reel from free spinning and hurting you in the process. We like the option to mount it vertically or horizontally as well as the ability to rewind it regardless of whether you are right or left-handed. The ten-year warranty on this model is also a great plus. You can do yourself a favor and skip those low-quality plastic reels for a quality model like this one. The benefits of having a hose reel are numerous. Top of the list is the ease of storage, the ability to neatly put away your hose and the convenience of mobility that comes with some models. Consider the above guide and reviews to buy the best hose reel your money can afford. Five Best Tile Saw You Need To Consider In 2018 To Cut Like A Pro!